Today was too nice a day not to tackle a mountain with a little more elevation than I have been climbing of late. 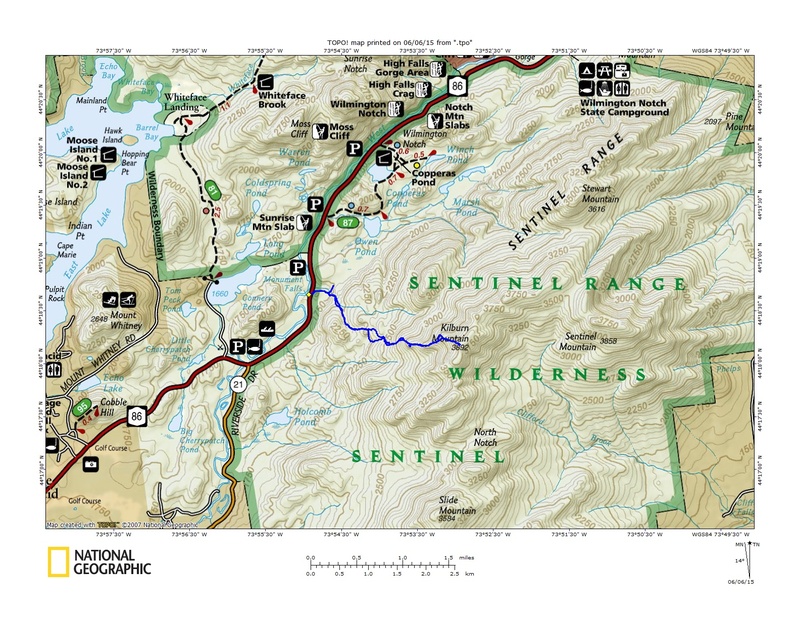 I chose to head for Kilburn Mountain in the Sentinel Range Wilderness in Wilmington, NY. 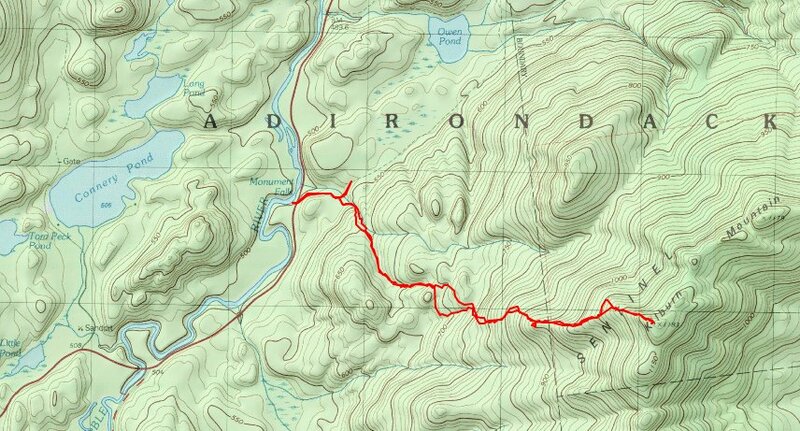 At 3892', Kilburn is actually higher than four of the ADK 46 high peaks. This would not be a long hike, but it's a workout for a five mile hike. I started out at 9 AM with my dog Rev. I parked at Monument Falls on Route 86 between Lake Placid and Wilmington. Directly across the street from the parking lot is an unmarked trail that provides a lead in for a quarter mile until I reached the drainage where I would veer right and loosely follow the drainage upward until it was time to head up the west ridge. I generally looked for the path of least resistance. Whenever there was a choice between hardwoods and pines, I chose hardwoods. As I got higher, I just tried to avoid any blowdown fields. Thick vertically is better than thick horizontally! I only ran into one area that I would call thick and that was the false summit on the west ridge. I had several glimses of Whiteface Mountain along the way and one look at Mount Colden and Algonquin Peak. Once I got past the false summit, I found a herd path which gave me an easy final push to the top. The one and only real viewpoint on the hike was about 100 feet before the true summit. This was an earth covered rock that offered a 270 degree view north, west and south. Looking north to Stewart Mountain ( I almost decided to continue that dierection). Once past the viewpoint, the summit was anticlimatic, but the top is the top. There was a small trampled spot and an orange piece of tape on a tree. After reaching the top, I went back to the viewpoint to have some food and drink. It had only taken two hours to reach the summit. The olympic ski jumps down below in Lake Placid. I contemplated heading north to Stewart Mountain but decided against it. I'll save it for another day. Rev and I went down the way we had come. She could easiliy smell our route and that saved me from having to refigure which way we were going. We got back to the car around 1:30. This was not an easy hike, but it was short, and I've seen woods that are thicker than this. The fantastic viewpoint was a definite plus. Glad I saw this report. We are hoping to be part time residents in Elizabethtown and I have been looking for some day hikes. This looks like a good one. Thanks. There are a lot of good hikes in the Elizabethtown area that don't involve the level of bushwhacking that this peak does. You have to enjoy bushwhacking for this one.